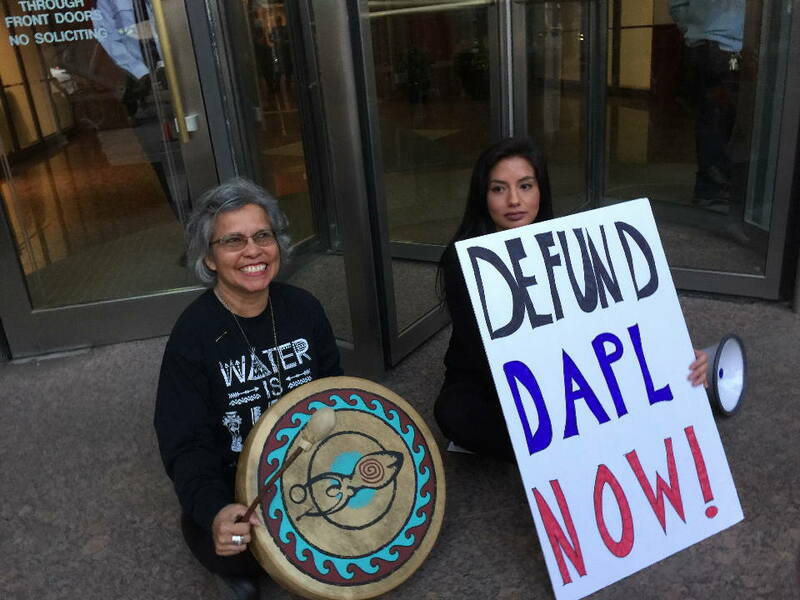 COLORADO SPRINGS, COLO- Water Protectors Jerima King (on left) and Karyna Lemus were arrested inside a downtown bank on Friday while trying to convey a message to Wells Fargo Bank to divest its interest in Energy Transfer’s controversial Dakota Access Pipeline. 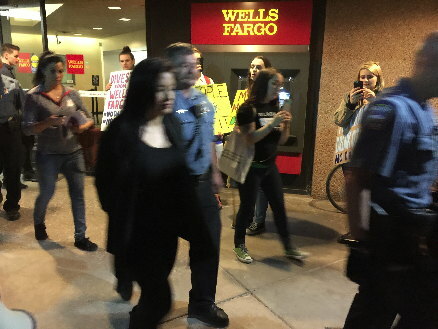 Protesters were denied entry into the Wells Fargo main location but marched to a nearby branch and entered its lobby before police were called. 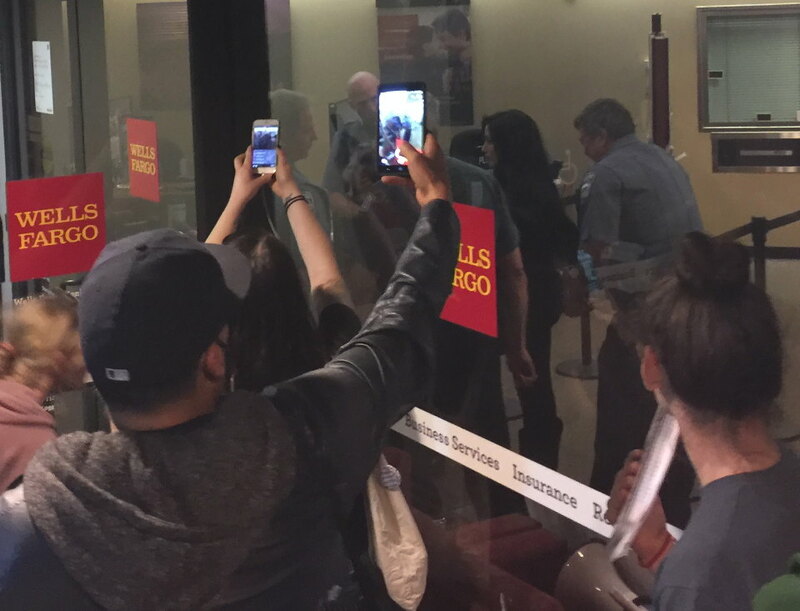 Several dozen Springs activists participated in coordination with protests at Wells Fargo banks across the country. 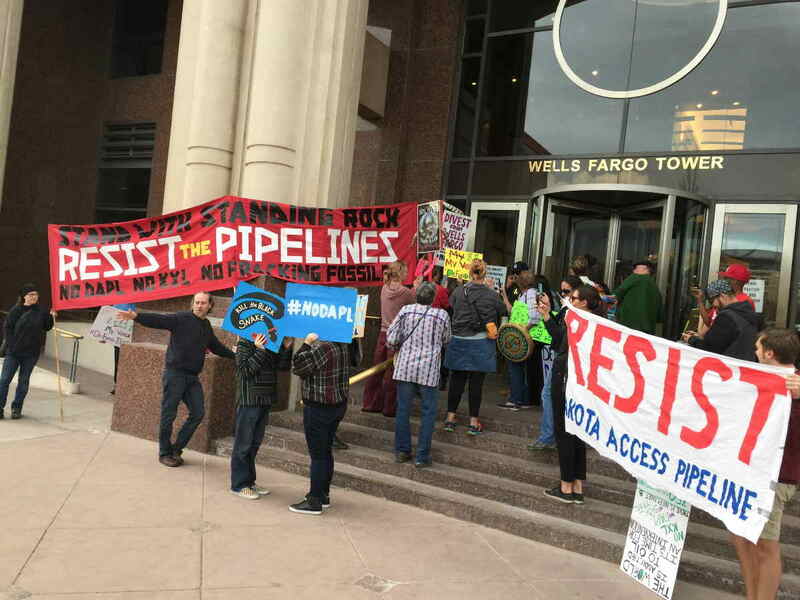 The bank doors were locked against the Water Protectors, who’d been asked to act in support of the Standing Rock encampment which is actively trying to block the construction. 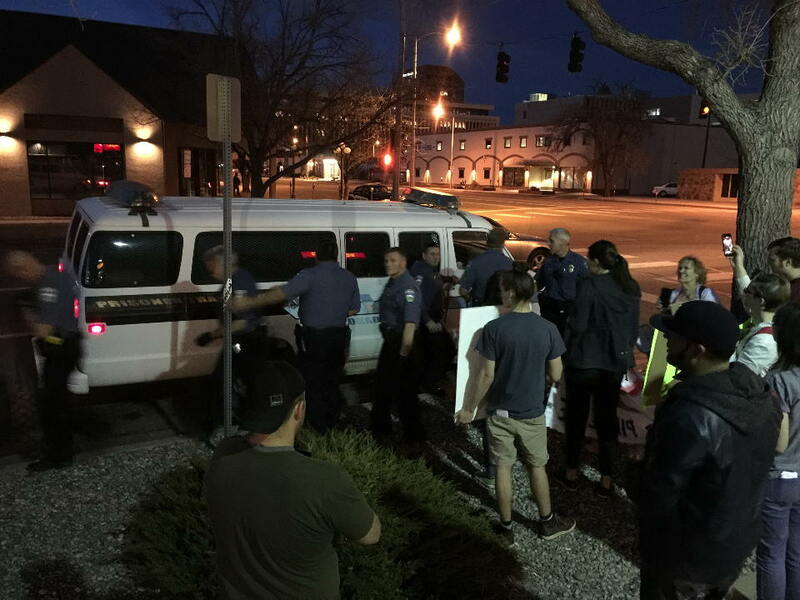 CSPD officers emerge to warn protesters that those who remain seated will be arrested. 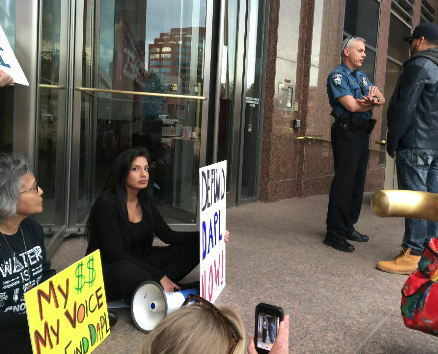 Before the protest had even begun, a CSPD paddy wagon was parked on the sidewalk next to the bank, to intimidate the activists. Earlier police officers circulated to tell everyone that they’d be allowed to enter, and be arrested if they wish. The police said they’d seen Facebook references to the desire to be arrested. 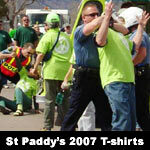 They wanted to know specifics of what to expect to ensure that no one would have to be hurt getting arrested. 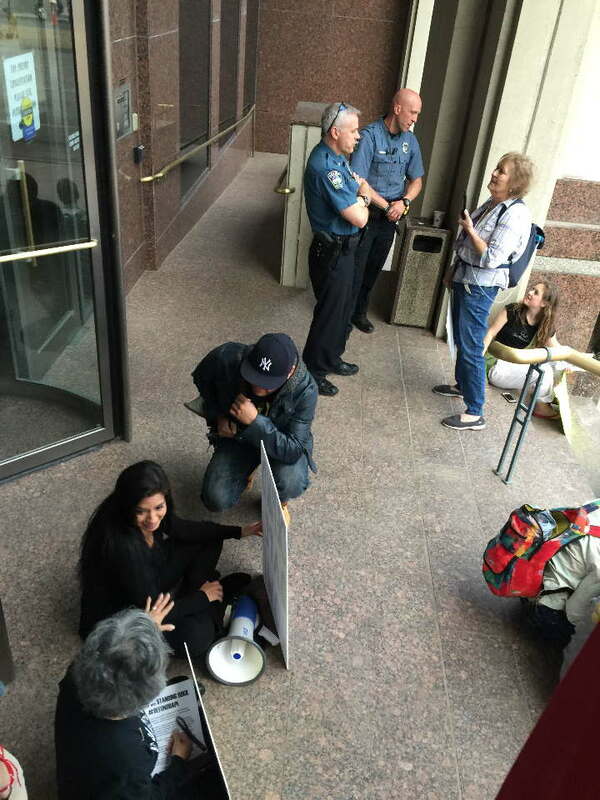 When the group tried to enter, the same officers blocked our way. They said “you can’t come in.” When I disagreed and pushed past them, they physically ejected me out the door. Then commanded me to rebove my foot from holding the door ajar. So much for the pre-arrangements touted by those protesters who’d taken their council. Since there was no gameplan to discuss, meaning there was no way to tell the police what to expect, the police were effectively disseminating the warning that being arrested unpredictably would mean getting hurt. 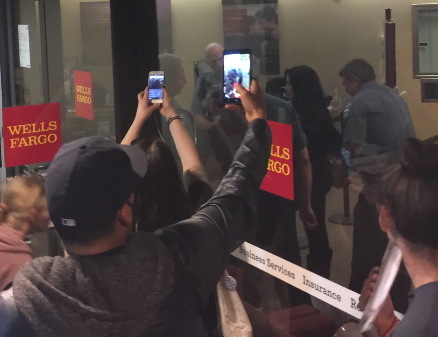 And there was never an intention to allow the demonstrators to enter the bank atrium, no matter how peaceful. The new CSPD warning was conveyed to Karyna and Jerima. 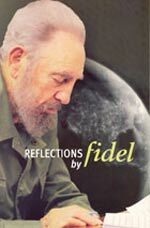 But everyone remained, whether seated or standing. After a brief rally at the front door. 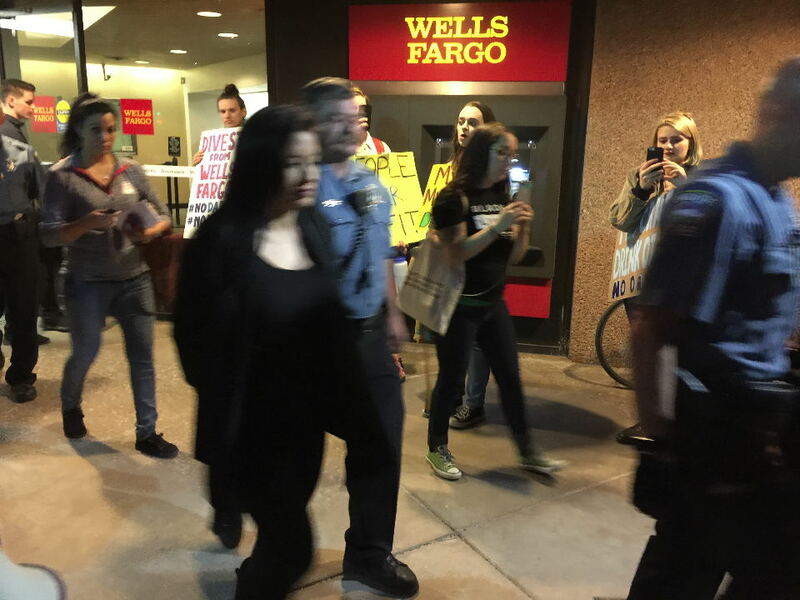 The water protectors discussed visiting a Wells Fargo branch four blocks to the south. Over the bullhorn we feigned disbanding, thanking everyone for joining in, then going to our cars. Except we appeared to have left our cars, all of them, in the same direction. 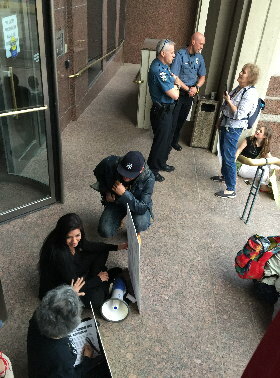 CSPD did not take note and we were able to reach the branch location and enter its lobby. There was not room enough for everyone in the tiny lobby. 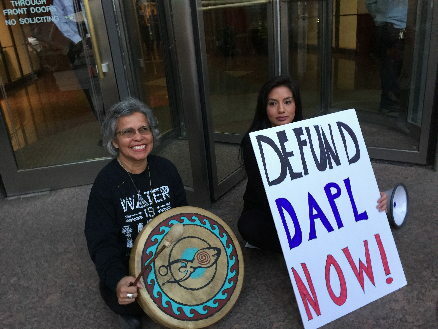 Note the bullhorn. 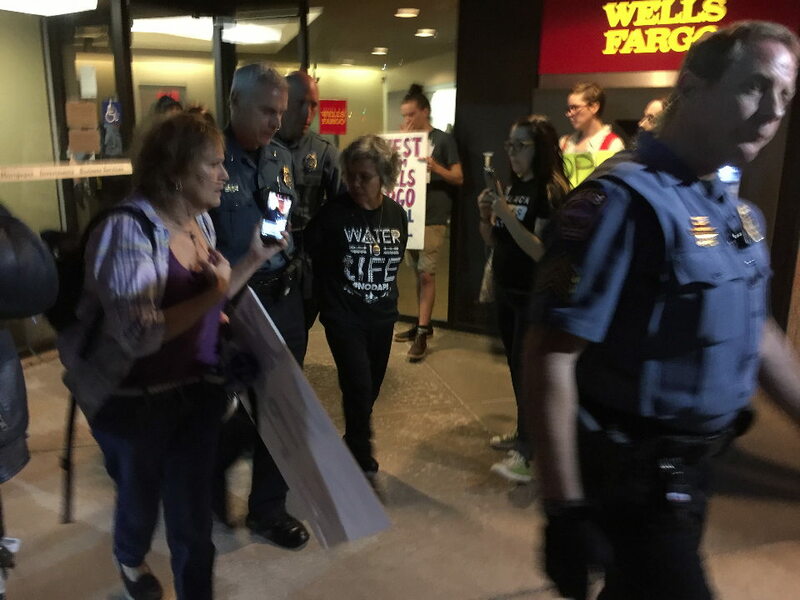 Officers arrest the two water protectors who stayed behind after the bank employees locked the doors. 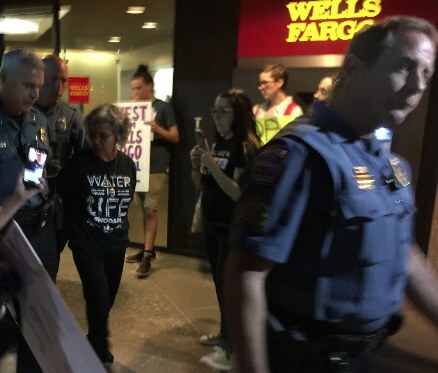 Water Protector Jerima King is led out in handcuffs. 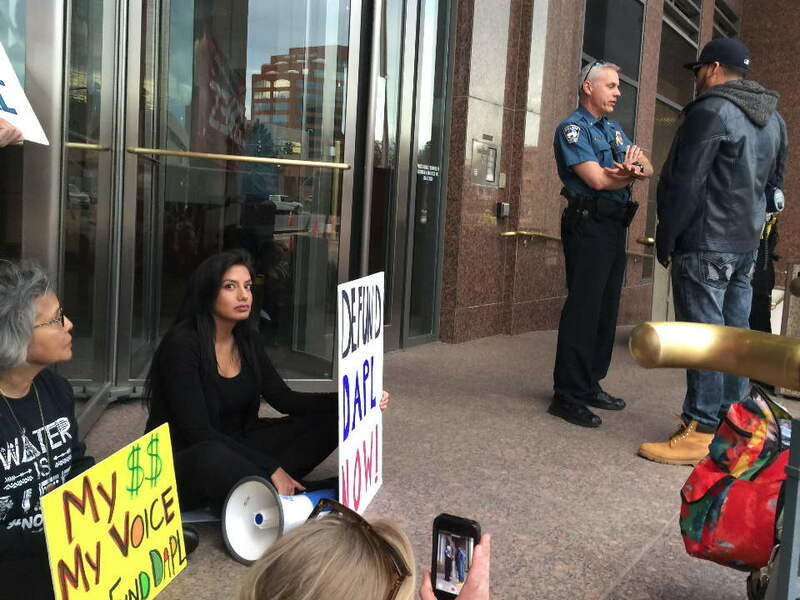 El Paso County Green Party upstart Karyna Lemus is taken in handcuffs. 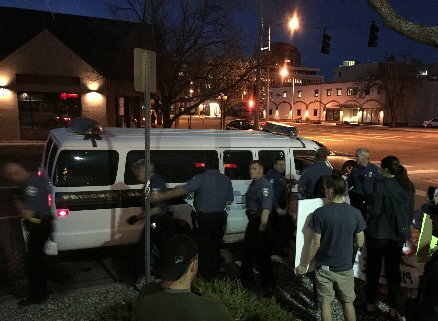 Arrestees were taken to CSPD HQ in a police van.